BFP Belts, Bags & Pouches promote efficiency on the farm and aid in compliance with the ever-increasing requirement for Health & Safety. Our product designs are the result of spending many hours of testing at the coal face of the Dairy Industry. Can you imagine a Builder doing his job without a Builders Belt? Not having items at his fingertips would be a significant hindrance to his ability to perform his job efficiently. The Milking Belt System is designed to be used at EACH Milking by EVERY Milk Harvester Used TWICE EVERYDAY! 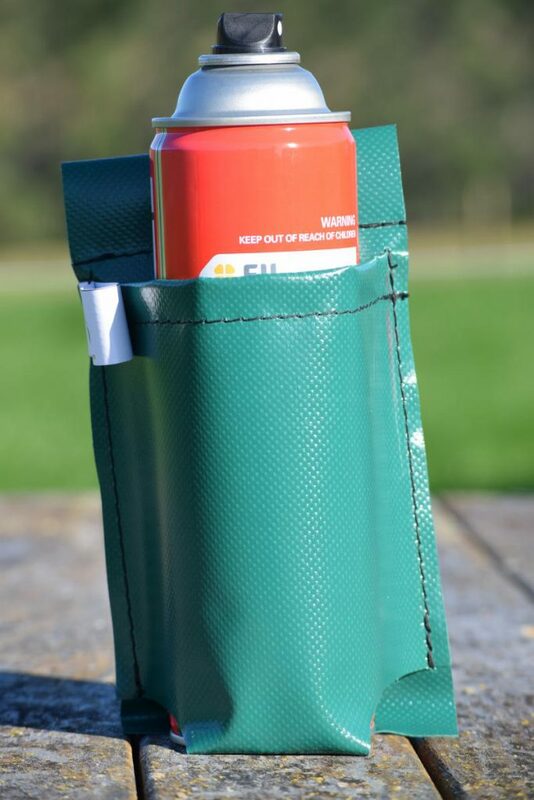 The pockets have the capacity to hold 500ml – 1000ml container in all pockets. It is attached to a belt that is worn around the waist making it both convenient and comfortable to use. 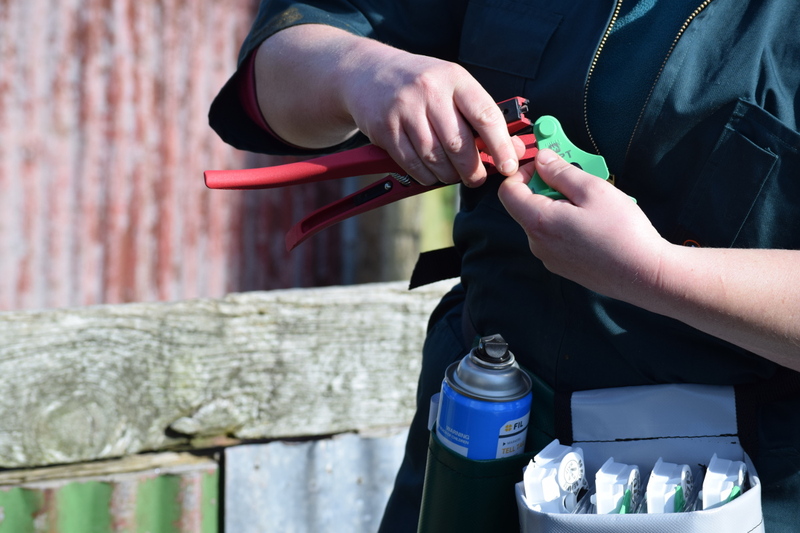 The Milking Belt System is ideal to carry your tail paint & iodine spray & even your coffee mug for those early morning duties while having RMT/Foam Marker at hand allowing immediate identification of Mastitis! 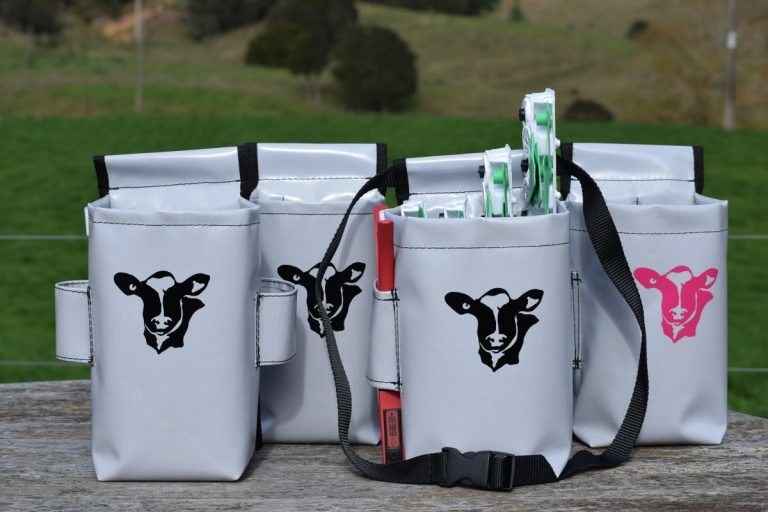 The Double Holstered Calf Tagging bag is purpose designed for tagging large herds. Calf tags slot into the bag and there is a side holster for the tagger. It is attached to a belt that is worn around the waist making it both convenient and comfortable to use. 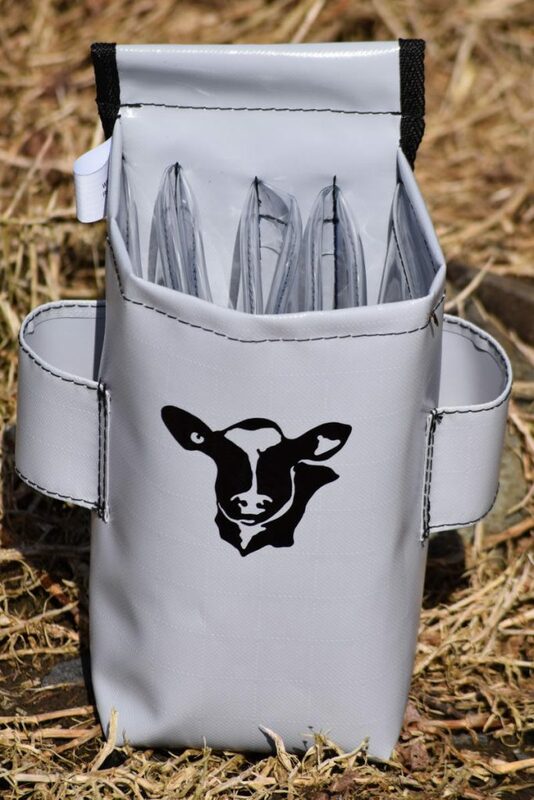 The Double holstered Calf Tagging Bag is ESSENTIAL for all Calf Rearers sanity! 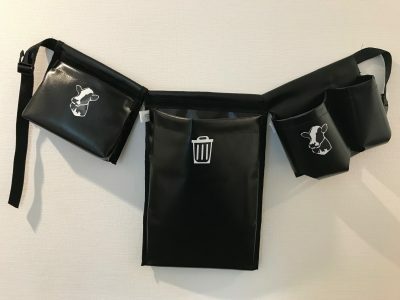 The tagging bag can be purchased individually and comes with the belt. 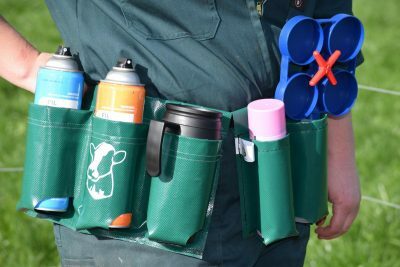 Other popular combinations can include the addition of single, double pouch for carrying tail paint, Tetra Vet, iodine spray and even a coffee mug. 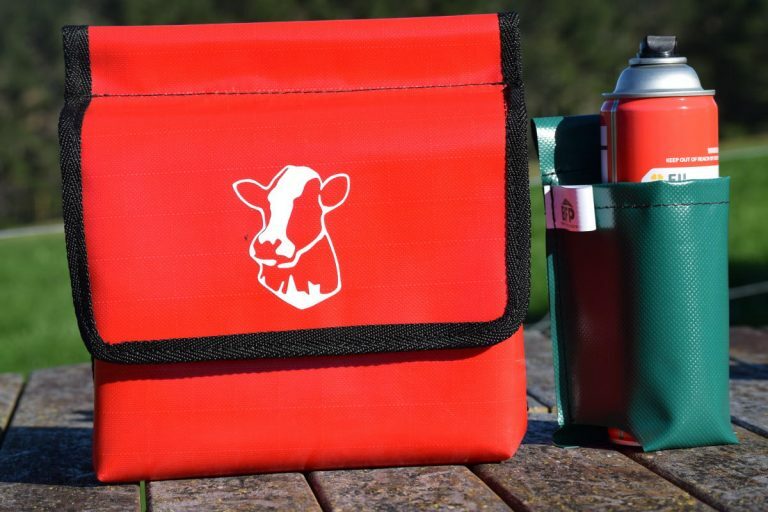 The Regular Animal Health Bag is is IDEAL FOR SMALLER HERDS or for use later in the season for larger herds! 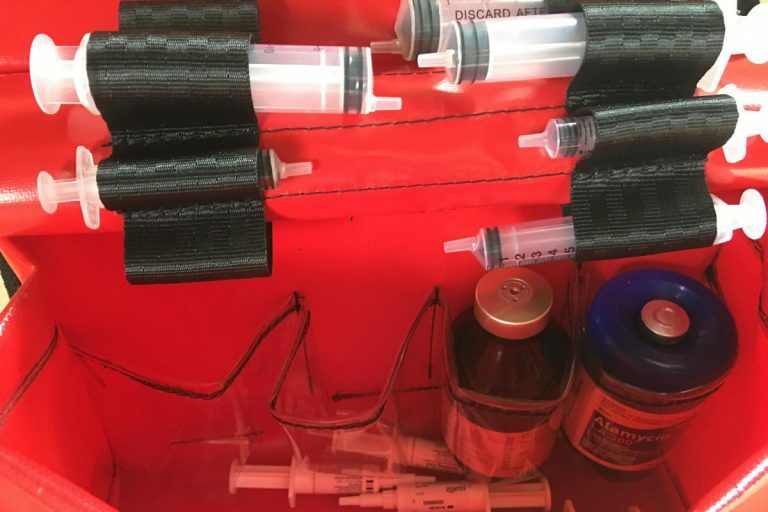 The lid is designed to Flap Over allowing 4 sleeves to hold syringes of all gauges, with loads of room to carry a palm pilot, cell phone, etc. for all your farm needs. It is attached to a belt that is worn around the waist making it both convenient and comfortable to use. The Regular Animal Health Bag is ESSENTIAL FOR ALL YOUR HEALTH REQUIREMENTS AT YOUR FINGER-TIPS. 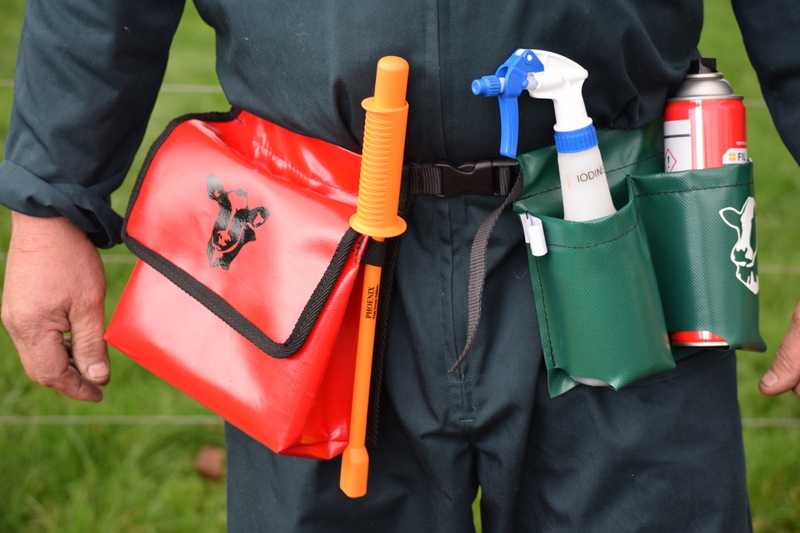 The animal health bag can be purchased individually and comes with the belt. 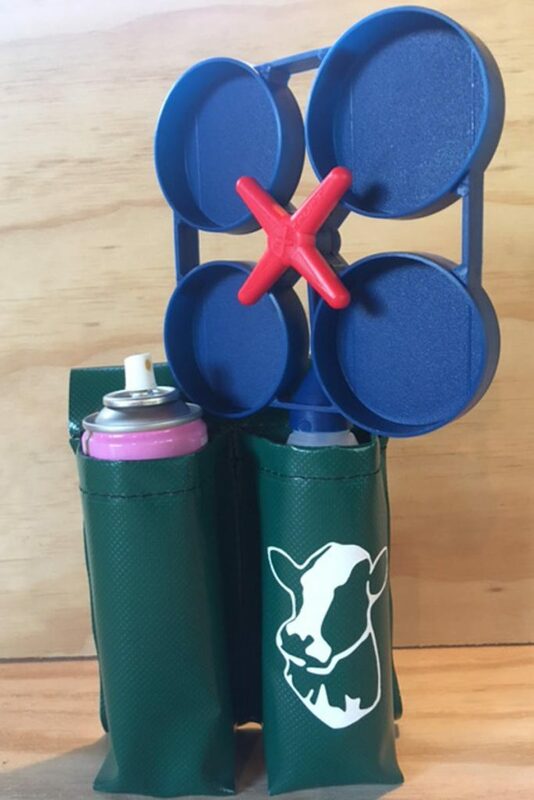 Other popular combinations can include the addition of single, double pouch for carrying tail paint, Tetra Vet, iodine spray and even a coffee mug. 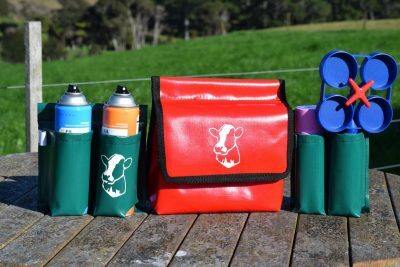 The Large Animal Health Bag is purpose designed for Large Herds! The clear pouch pockets allow for easy identification of drugs, with loads of room for essential things to be carried at the bottom of the bag. 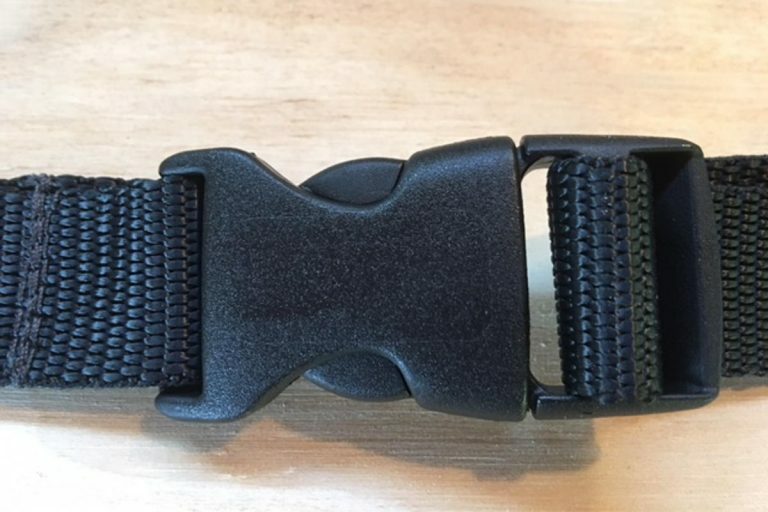 It is attached to a belt that is worn around the waist making it both convenient and comfortable to use. The Large Animal Health Bag is ESSENTIAL FOR ALL YOUR HEALTH REQUIREMENTS AT YOUR FINGER-TIPS. Jenny nursed for 25 years before entering the Dairy Industry. She was used to working in an environment that was structured and driven by Procedures and Protocols. Time Management and Health & Safety was an integral part of daily working life. This work ethos followed her into the Dairy Shed. It was not long before it became apparent that milking time and efficiency could be improved, hence the inception of the first proto-type, the Milking Belt! Mark has been in the Dairy Industry for 40 years. Learning the ropes in his Dads Shed at 15, progressing to Share Milker on smaller Units and then progressed to equity Shareholder/Manager on a 1500 Dairy Unit Conversion in North Otago, a 60 Bale Rotary Shed on the main Milking Platform and a 36 aside Herringbone on the smaller Unit. Together they have put every bag and pouch through its paces to become tried and tested products. We believe that our BFP (Best Farm Procedure) Belts will become a daily part of Dairy Farming. Colostrum Herds, Milking Herds, Red/Sick/Lame Cows, Mating, Tagging, Drying Off. (All Hands on Animal Husbandry Tasks.) Calf Rearing, Tagging etc. The Belts also promote efficient use of time and resources and help with compliance to Health and Safety regulations and have a wide application in all rural sectors. Milking Utility Belts & Animal Health Bags with different components to suit common farming prctice. The Animal Health Milking Belt System is purpose designed for any sized herds! Animal Health Bag System is ESSENTIAL FOR ALL YOUR HEALTH REQUIREMENTS AT YOUR FINGER-TIPS. 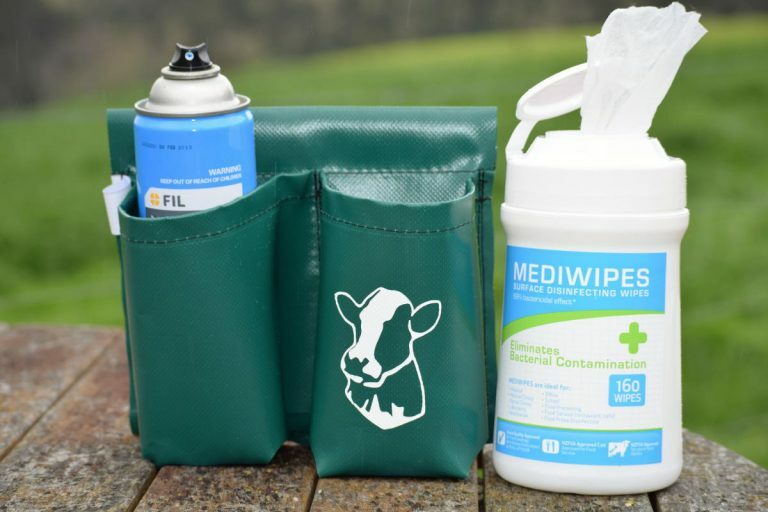 The Calf Health Bag is is IDEAL FOR USE IN CALF PENS for immediate and convenient treatment when required. The Calf Health Bag is ESSENTIAL FOR ALL YOUR HEALTH REQUIREMENTS AT YOUR FINGER-TIPS. 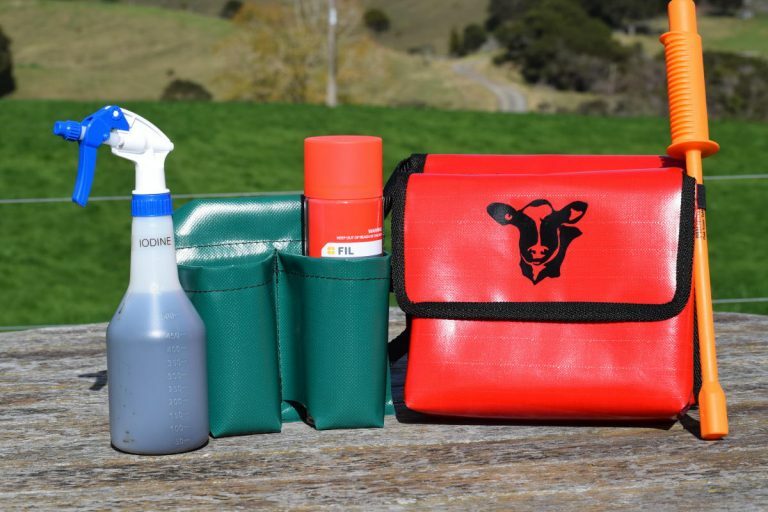 The calf health bag can be purchased individually and comes with the belt. 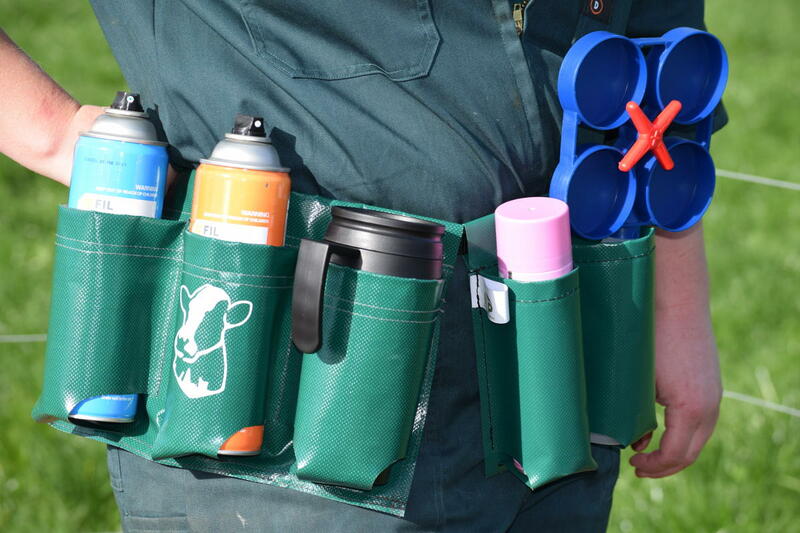 Other popular combinations can include the addition of single, double pouch for carrying tail paint, Tetra Vet, iodine spray and even a coffee mug. 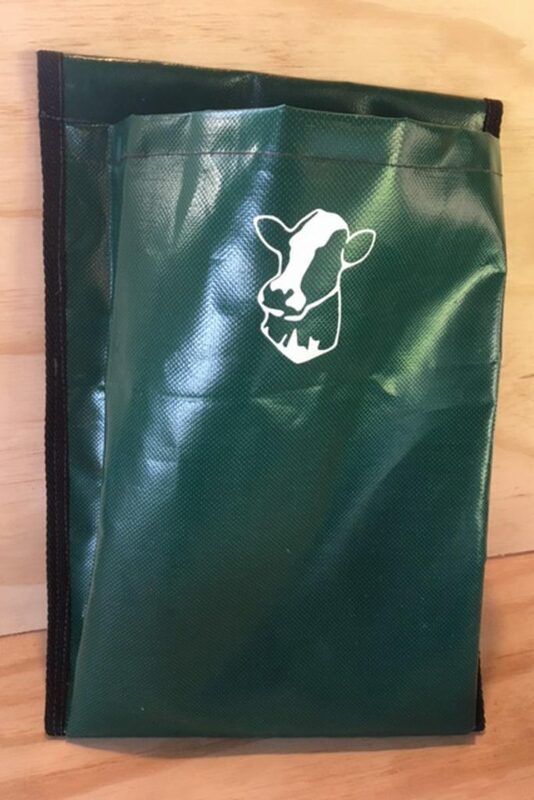 The Calf Tagging bag is purpose designed for tagging. The Calf Tagging Bag is ESSENTIAL for all Calf Rearers sanity! All BFP Components are Designed and Made in New Zealand. They are manufactured with quality marine grade materials. Are TOUGH and DURABLE in any conditions.